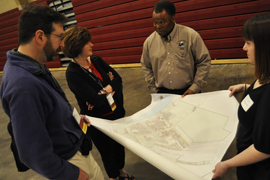 On Saturday, April 10, 2010, a group of planners took a bus ride to Donaldsonville, Louisiana, to meet with and lend their expertise to an excited group of the city's residents and leaders to help develop a vision for the small, but rapidly growing city's future. More than 60 residents and leaders greeted the eager group of planners upon arrival. The Community Planning Workshop consisted of three breakout sessions on three of the community's identified needs, which include: infrastructure, housing, and community perception/image. Each group produced a wealth of insights and local knowledge that allowed the team of planners to engage directly with residents and constructively enter into an ongoing discussion of the city's future direction. Donaldsonville, about one hour outside of New Orleans, is located in Ascension Parish, one of the fastest growing parishes (counties) in the State of Louisiana. The parish's convenient location between Baton Rouge and New Orleans along with its available land, significant industrial development, and strong public schools are all contributing factors to its growth. In addition, the parish's population experienced a spike of approximately 10,000 new residents after hurricane Katrina as many decided to resettle in the growing area. Much of the growth is taking place incorporated communities located on the border of East Baton Rouge Parish and within and around the parish's largest city Gonzalez. There are three incorporated municipalities with Ascension Parish: Gonzalez, Sorrento, and the parish seat Donaldsonville. There is a commitment on the part of city and parish leadership to ensure that planning activities are aligned. Breakout sessions with the residents and planners focused on three themes the residents and organizers deemed critical determinants of the city's immediate and long-term future: infrastructure, housing, and community perception/image. During the reporting out period, each group's facilitators outlined the most salient points of each discussion. While the city's issues are clearly interrelated, housing was considered one of the most pressing issues, which was underscored by the Donaldsonville mayor who addressed the entire group in the afternoon. The housing breakout group highlighted a need for more affordable housing, new programs to increase home ownership, and repurposing existing structures to support new housing initiatives. Because Donaldsonville does not currently have a community development corporation (CDC) to assist in this process, ideas emerged from the group to reach out to other CDCs in the area to partner with. The community perception/image breakout group identified the need to brand and promote the city's rich cultural and arts institutions and programs that already exist. Delivering increased amounts of resources to these institutions and programs will be vital for the successful economic development of the city. Donaldsonville also possesses a remarkable number of historical resources, which was identified as a core strength to build upon. The long and unique history of Donaldsonville provides an American story that desperately needs to be shared with a wider audience. The group also shared that residents and other stakeholders need to get involved and stay involved in city politics to ensure that these ideas are continually voiced and heard. Funding is frequently a problem and brainstorming for new ideas will be a vital part of this continued involvement. The infrastructure group helped pinpoint some of the economic development issues and key opportunity sites located in the city. Transportation services that provide increased access to impacted residents beyond just the elderly population were reported as a key concern. Additionally, supplying the infrastructure needs of the Historic District should be a main focus. The Historic District encompasses an area of about 50 blocks. Many of the 640 buildings located within the District date mainly from 1865–1933 and include residences, commercial and public buildings, five churches, and three cemeteries of the Roman Catholic, Protestant, and Jewish faiths. In fact, it is the second largest historic district in the State of Louisiana. The district is unusually large and retains a sizable complement of working-class areas, complete with housing (shotguns, cottages, and bungalows), as well as early neighborhood stores. Notably, the activities of the River Road African American Museum have enhanced the programming of the district to include the significance of the African American communities along the Mississippi River. The day was filled with a sense of collaboration and the welcoming spirit of the residents helped make the workshop a success. As an example of the city's involvement, a homemade lunch was prepared for the participants by a local councilman. APA wishes to thank the local host committee, which has worked and will continue to work with a steering committee of local leaders selected by the mayor, city staff, and parish leadership for developing this Community Planning Workshop. Following this workshop, the team leader and APA staff will work to produce a final report that captures the project background, recommendations, phasing, and implementation strategies.